Receding gums is a problem that does affect a large portion of the nation. There are a number of reasons that can lead to your gums receding. Not only does it affect the aesthetics of your smile, but it can also lead to unpleasant sensitivity and also tooth decay. Both the latter problems can lead to further problems which can lead to more serious conditions, causing severe discomfort and pain. Brushing Too Hard - One of the biggest culprits can be caused because of brushing your teeth too hard. It is very important that you have a very active dental hygiene regime, where you brush your teeth at least twice a day, but you need to ensure that you brush carefully rather then forcefully or too hard. The gums are very sensitive and can easily be worn away or permanently damaged. Gum Disease -Ironically the other major culprit gum disease can be down to lack of brushing and regular dental hygiene. By maintaining a healthy oral hygiene routine you will be brushing away a build up of the plaque and tartar, and actively be combating the chances of getting gum disease. Gum disease happens when the bacteria in your mouth starts to build up and eventually turns into the hard substance of plaque and tartar. This bacteria will actively attack your gums and one of the most common signs of gum disease is when they start to bleed (most noticeable during brushing). When plaque does build up it becomes increasingly harder to tackle the problem yourself. We recommend regular visits with the hygienist who uses their skill & professional dental equipment to tackle tough plaque to achieve dental health. As gum disease develops and progresses the gums can start to recede which will shows a larger portion of the teeth. Sensitivity and pain can occur due to this, and teeth can start to become loose and even fall out if the gum disease progresses into advanced periodontitis. 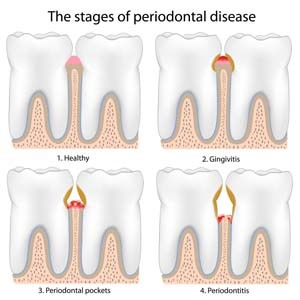 When gum disease does advance you will need to be referred to a periodontist. This is a specialist role in a dental practice that treats specific gum disease cases. Our in house periodontist is Dr Clifford Nissen. Depending on the level of your gum disease the treatment will vary from pocket planning to complex sinus lifts. Our periodontist would first see you for an hour long pocket planning appointment to determine the level of the disease. He will then write a detailed treatment plan outlining how we can help treat you for this condition. Gum disease can be a very serious and nasty condition to have, which can also be costly to treat as well. We always try to educate our patients in dental hygiene to help them fight the problem before they even occur. By attending regular dental appointments and hygiene visits (with a healthy hygiene routine at home) you can actively protect your mouth from nasty conditions occurring. We will always check for signs of gum disease at regular check ups and the earlier problems are noticed, the less expensive and easier it will be to treat them. Normally by the time you start to feel gum irritation and pain, it has progressed past the simple preventative stages and may require additional treatment. If you are worried you may have gum disease please do not hesitate to contact us and book your free consultation.